monitor your employees' in-time, out-time and total number of hours worked, including break intervals with ease! Managers can track their employees' time and attendance from anywhere and at any time. You can use an API to integrate the attendance management software with any type of attendance terminals in your organization. This includes online web check-in and check-out that lets managers control where an employee can clock-in/clock-out from. Entry and exit data of your employees will be captured and the total number of hours worked will be calculated automatically. 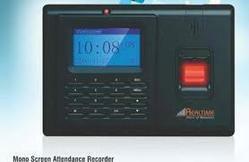 Looking for Attendance Machine ?